I’ve just received my DNA results and my ethnic story has slightly rewritten itself. For most of my life I’ve felt very strongly Welsh but always with a strong pull towards Ireland. The first time I ever visited there (Donegal) I knew it was my spiritual home and in many ways my journey on Ancestry.com has been about confirming that. I found the link quickly, on my mother’s side – a very clear line coming from Ireland to Liverpool and then into North Wales. It explains the Catholicism and the twinkle in the family eyes. Growing up, my mother told me her family thought there might be some French blood in there – she had a French nose, she said. She also had glorious cheekbones. There had to be something else mixed in. There is – 26% Western European (likely to be Belgian, French, German or Dutch – even Swiss). Later in my life, I’ve wondered if there was some Jewishness in me – it turns out there is – 4% to be exact – probably from Eastern Europe. As well as an unsurprising healthy dose of Scandinavian blood, there is the very small matter of 1% East Asian. A friend tells me I’d only need to go seven generations back to find a full Asian parent in my ancestry. I wanted a surprise and I got one – how cool would it be to track that parentage back? One thing’s for sure, I am a woman who feels connected with the world beyond our shores and this DNA test confirms it. I’ve had some friends take this test and been wholly blindsided by the reversal of the narrative around their ethnicity. Barring the Asian curveball, I am pretty much who I thought I was. Perhaps a tad less Celtic than I thought but a strong European mix. But other people have discovered that their family story isn’t quite as it’s been told over the years. It makes me think of the Alistair McGowan episode of the BBC’s Who Do You Think You Are? when the impressionist was blown away by his father’s Anglo-Indian roots and the fact that his name hails from Ireland, not his beloved Scotland, where he’d always felt a spiritual pull. As my mum used to say, it just shows to go you. It’s made me think about how we construct narratives around ourselves to make sense of our place in the world. I’ve spent years trying to place myself – ethnically, professionally, socially – and this blog is part of that exploration. If you don’t fit a pre-set narrative, this is what you do. As a fifty-one year-old woman I ‘should’ be juggling my publishing career with a bunch of teenagers and mid-life crisis man at home. I ‘should’ be holidaying in a cottage in Cornwall with my family, not preparing to trek through Kyrgyzstan with a group of mostly strangers. 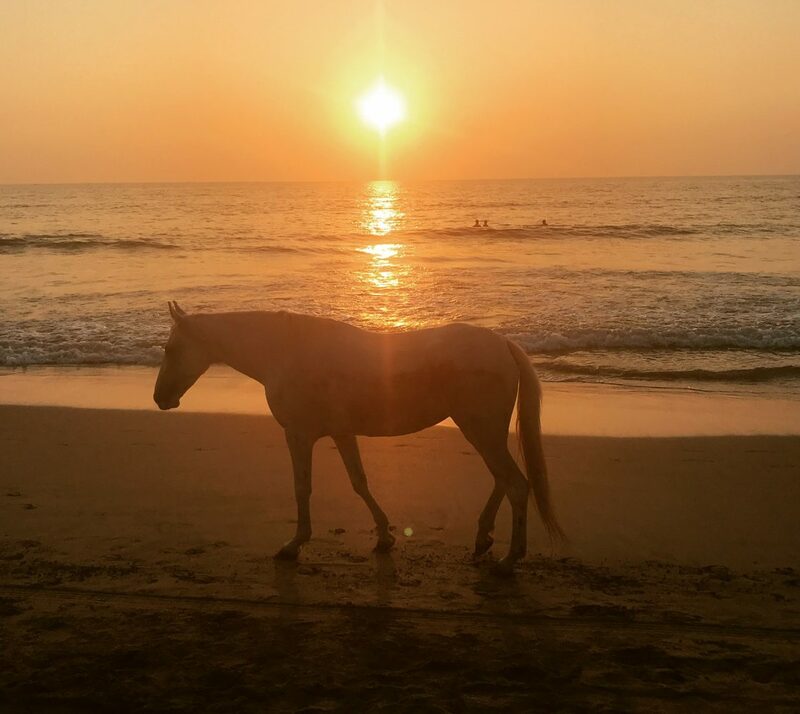 I ‘should’ be spending Christmas in a chaotic household filled with multiple generations, not walking along a Goan beach, solo, with an occasional white horse for company. I’ve compared my own story with other stories of like women. I connected with Elizabeth Gilbert and her Eat Pray Love story, but over time I realised mine was not going to end with the Love bit so I looked for a new narrative to connect with. I found another with Cheryl Strayed when I read Wild, and then saw the movie. A woman who’d lost her mother and then gone wandering off into the wilderness to find her true self. But again, that narrative ended with marriage and babies. I’m sensing that this is not my true path. In the search for my own narrative I’ve found pieces of others’ that have resonated hugely but no one story arc that matches mine. I’ve tried to find an essential truth behind what happened to me and why, tracing from my happy childhood, through the pain of early parental loss and the fracturing of a family, to a coupling and decoupling, and an establishment of my solo self. I want to get to an absolute truth and tell the story, and not hide the reality. Over a number of years, I’ve developed a habit of seeking out and telling the truth (as I see it) about situations. I’ve also discovered that sometimes people don’t really want to hear it and prefer to believe a falsehood to make themselves feel ok. Maybe because I had to face reality so early on in life I prefer to look at things square on, and not flinch from the truth. I want to prepare myself for the reality, and not believe in false hope. I like to know what the exact weather forecast is and be ready for it, rather than ‘hope’ for the sun to come out. That way disappointment lies. In the workplace over the years, I’ve become the ‘meme destroyer’ – running around throwing proverbial wet cloths over flaming untruths that gather around rumour and conjecture. I’m always amazed at how far these will go and what people are willing to believe. And also, how disappointed they are sometimes when you tell them the truth – when there’s nothing to complain about any more (ditto the weather). I once worked for a company that was described to me early on as a ‘dysfunctional family’, when in fact it was more akin to a domestic-abuse situation. The staff who’d worked there for a long time described office life there as ‘rough and tumble’ and the boss as ‘a bit of a character’ – I called it being bullied by a manipulative narcissist. People refused to hear it at first, but gradually, even now, after a few years, I received emails from them saying ‘you were right’. I could see that they had constructed narratives to be able to cope with the situation and told themselves they were true. They didn’t want to hear me state the reality out loud. But I had to. The boss hated that I walked around with a folder containing the facts, not willing to listen, let alone believe, the gaslighting. In many ways I’m glad I’ve retained a willingness to believe someone’s story, in spite of being spun so many falsehoods over the years. I’m rewriting my own narrative on a daily basis, but I try to root it in the absolute truth – and here it is, on the third anniversary of me starting this blog. You can choose to believe my story or wait for a video to prove it.